As soon as I checked into my hostel on Wednesday morning, I threw my backpack on my bed and immediately jumped into a tiny European rental car with my four newest travel companions. The Fashionable Filipino was the man behind the wheel and handled navigating the narrow cobblestone streets of Ponta Delgada. We hopped onto the main highway and headed straight towards Ribeira Grande, the second largest municipal on Sao Miguel. Ribeira Grande is situated on the north coast of Sao Miguel on the river the city was named after. The city was first settled in 1507 because the land was extremely fertile. Farming is still one of the main occupations in Ribeira Grande. We found a free parking spot on a narrow side street near the main church, Igreja Matriz. The weather was chilly and windy. We walked towards the water and the saltwater swimming pools built into the rocky coast. 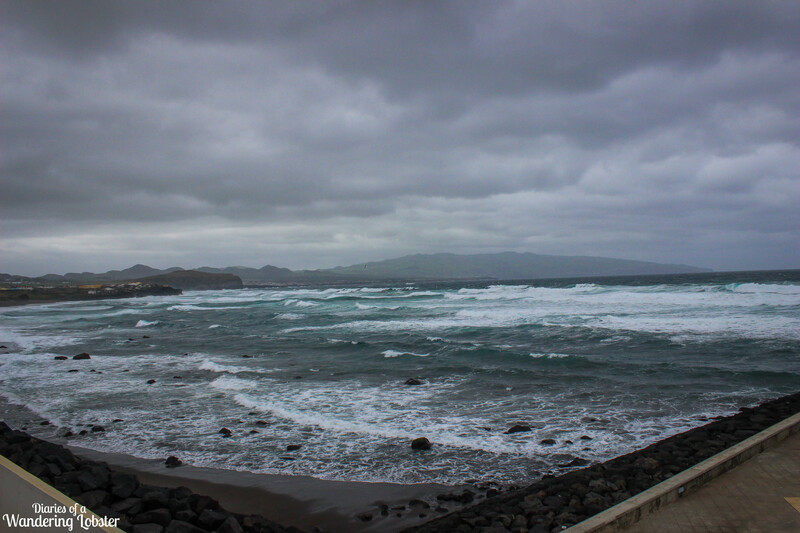 Due to the high winds, the waves were thrashing into the black volcanic rocks that form the coastline of much of the island. After freezing our butts off while getting sprayed by the salty mist of the Atlantic Ocean, we retreated back to our little car and drove to our next stop, Cha Gorreana Tea Plantation, just outside of Ribeira Grande. Cha Gorreana is Europe’s oldest tea plantation operated by a single family since 1883. The tea at Cha Gorreana is world renown and can be found on thousands of breakfast tables across the European continent. The tea plantation is generally open daily for visitors and offers free tea samples. After spending some time in the cold, the hot tea helped warm up my cold fingers and nose. There is also a small gift shop that sells snacks and tea. The tea was cheap and I purchased several types. As an avid tea drinker, I was quite impressed with the quality. Unfortunately the workers weren’t working the day we were there so I couldn’t see the plantation in action. Next time! Once we were back in the car, the two boys were on a mission to find a hidden waterfall. We found the waterfall near Lomba de Sao Pedro. We randomly drove up a narrow and winding side road and it appeared out of no where. The waterfall is quite stunning and I was impressed by the beautiful flora around it. And then the Baby told us that the waterfall is man-made. The Baby had done a waterfall repelling adventure a week before so he knew the waterfall quite well. Apparently years ago some of the locals decided to divert the river and thus the waterfall was created. It was kind of disappointing to learn that it was man-made, but it was still pretty. After a quick break and a small purchase of cookies to get me through the next couple of hours before dinner, we were back on the road heading south towards the town of Furnas. The Baby wanted to stop in the small village of Faial da Terra since he was leaving the next day to spend a week WOOFing at a small farm there. The ride down to the small town was a wee bit scary. The main road is set up high on the ridge, but the small fishing village is located down a very steep and winding road on the coast. After about 30 minutes of riding our brakes down the road, we arrived in the tiny town only to get lost trying to find our way out! At one point we drove down a road that wasn’t even a road and had to back up. Oops! Luckily most of the locals speak English and were able to redirect us towards Furnas. We began our slow climb out-of-town and towards the main roads. At this point I was starting to feel slightly car sick. These roads are crazy! The ride to Furnas took us about an hour. Not because Furnas was far from Faial da Terra, but because the roads climb through mountains and twist every which way. We arrived in Furnas after dark and starving. Furnas is home to hot springs and geysers where locals cook the traditional Portuguese stew called Cozido. Cozido is similar to a New England boiled dinner, but it is cooked by the geysers of Furnas. We went to Restaurante Tony’s with its orange walls and free wifi. I split a large plate of the Cozido with The Baby and indulged in a local beer. Our dinner conversation was the best part of the day. I learned a lot about my fellow travelers and where they originated from in this big world. Uzbekistan sounds like quite the interesting place. After dinner we spent about 10 minutes driving circles around Furnas trying to find the hot springs. Since it was dark we were able to locate them via the steam clouds in the air. Perfect! I can’t remember the name of the hot springs as there are several, but this one had two pools (although a couple were also under construction) and cost 2 Euros. The hot springs felt amazing. It brought back many memories of all the times I have been to the hot springs in Montana. We spent a couple of hours just relaxing in the various pools. I think we all became prunes by the time we got out of the hot water. After running to put our warm clothes back on before we froze in the cold night air, we headed back to the Vintage Place in Ponta Delgada for a long night of sleep. Do you like road trips? Where are your favorite places to road trip? Hello from Belfast Maine. My wife and I are on our way to the Azores on the 21st of Feb and spending 4 days there before going to Mediera, Lisbon and on to Spain. Any hints for maximizing our time on the Azores? Oh no! I hope this isn’t too late! Sao Miguel is a small island so four days should be plenty to see all of it. Definitely rent a car. Spend one day exploring Ponta Delgada and enjoying the food and the atmosphere. I found the locals very friendly and almost everyone speaks English. I then recommend spending a day road-tripping down the south and west part of the island to see Sete Cidades and the Black Sand Beaches. On the next day head north. It’s fun to stop and explore the little villages along the way. The roads are crazy windy so if you or your wife are prone to motion sickness, beware!